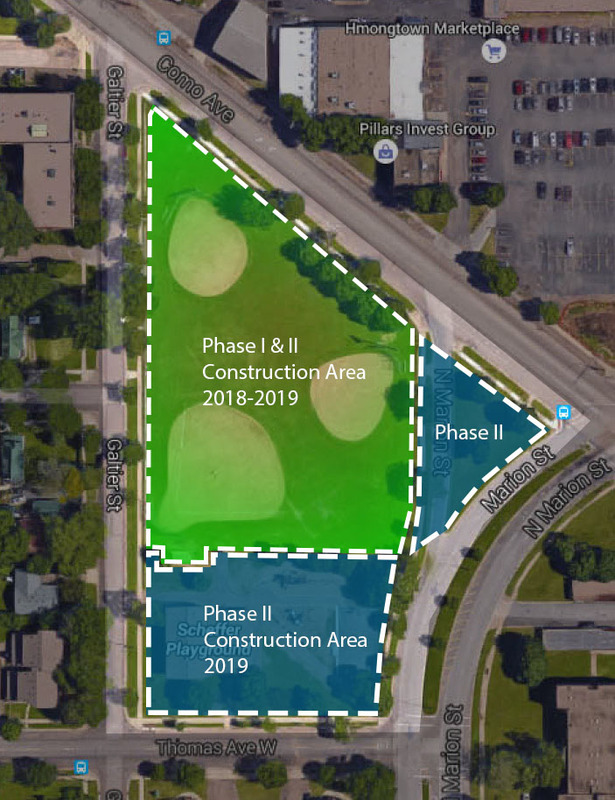 The City of Saint Paul Department of Parks and Recreation is excited to move forward with construction of a brand new Frogtown Community Center to replace the existing 1970’s Scheffer Recreation Center building. Through the Capital Improvement Budget (CIB) process, funding was approved for planning, design, and construction of a new recreation center building and substantial improvements to the park. The Design and Construction division of Parks and Recreation has partnered with the talented design team of JLG Architects for this work. Through a community engagement process consisting of surveys, open house meetings, pop-up meetings, and a community advisory committee, it was determined that the new facility should include community rooms, an arts room, seniors room, teen room, kitchen, Rec Check after school space, full-size gym, fitness room, walking track and parking. These socially and physically active spaces will be a part of the new facility which is now under construction. See the following link for pictures of exterior masonry construction and progress on the interior spaces through the end of November 2018. Work continued on track through the end of 2018 and is on schedule to be completed in late summer 2019. Click the link below for additional pictures of construction including the addition of exterior metal panels and development of interior spaces. 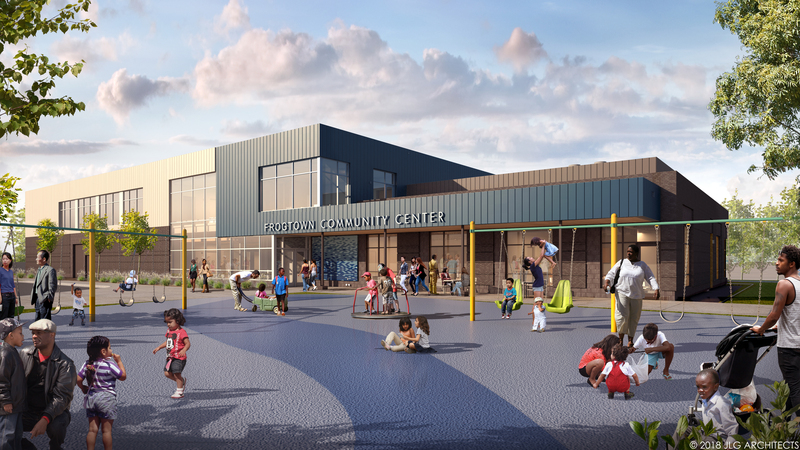 On July 16, 2018 during a groundbreaking ceremony, a new name was announced for the facility: Frogtown Community Center. The new name is a result of a community engagement process conducted online, onsite at Scheffer Recreation Center, and at the nearby West Minnehaha Recreation Center. Below is the concept plan for the future of the park. 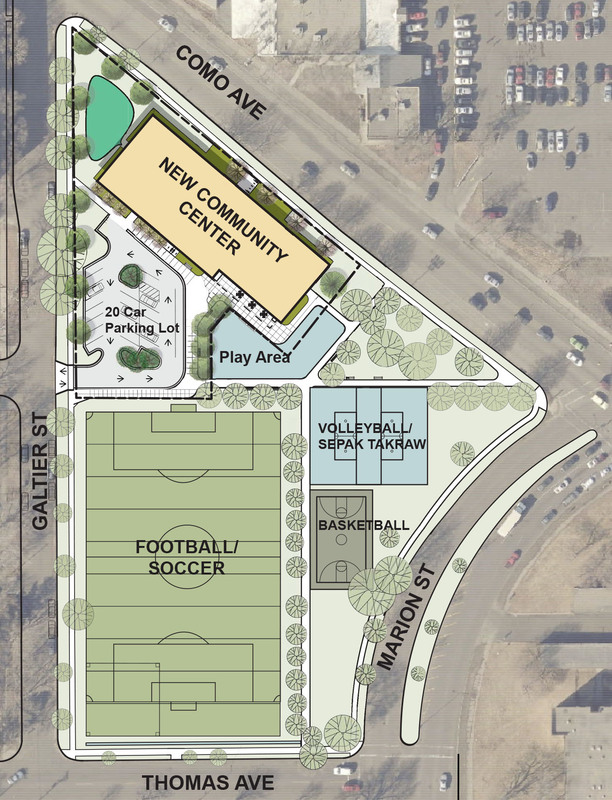 The Frogtown Community Center will be located on Como Ave. with parking, play area, courts and fields to the south. Changes to the Como Ave./Marion St. intersection are pending and currently being studied with hopes to be implemented in Phase II. Construction of the new Frogtown Community Center will occur in two phases: Building Construction in 2018-2019 and Site/Park Construction in Summer and Fall 2019. The construction fence around the site is expected to be in place for the duration of the project. If there are changes, it will be updated on this website. During July and August of 2018 the contractor will be installing storm water mitigation systems, site utilities, foundations, structural walls and structural steel. As the weather turns colder this fall and winter, work will shift to the interior spaces and finishes of the new building. The anticipated completion time for the project is early fall 2019. Please see the information below about some of the community meetings held during the design phases of the project. The first Open House occurred on November 16th, 2016 from 4pm-8pm at Scheffer Recreation Center. This was an opportunity to learn more about the project from the design team and provide ideas for the future Scheffer Recreation Center building and park. Visitors to the open house had the opportunity to hear about some of the activities and spaces being considered and express opinions for those they were most interested in. City staff was in attendance to help translate questions, concerns or interests into Somali, Karen, and Hmong languages. The results of the open house can be viewed here. A Community Advisory Committee (CAC) has been organized to improve communication and generate ideas with the design team. The first advisory committee meeting was held at Scheffer Recreation Center on November 30th, 2016. On the agenda were results of the community engagement efforts to-date, planning and programming ideas, and general project information, such as anticipated budget and schedule. Four different concepts for the location of the building on the site and park layout were discussed and evaluated. The study concluded that positioning the building on Como Avenue offers the most opportunity to maximize the site. Please see the links below for further information about the meeting, including notes and presentation slides. The second meeting of the CAC was held on Monday, December 19th, 2016 at Scheffer. Results of the first CAC meeting were reviewed and followed with a presentation of initial plan layouts and related case studies. Changes to the plans should be expected, however the plans are helpful to understand potential adjacencies and the scale of different spaces in the new facility. Notes from the meeting and the presentation slides are included below. On January 24th, 2017 an advisory committee meeting was organized at Scheffer to discuss the project progress, including a first look at anticipated exterior materials. This meeting coincides with the completion of the schematic design phase of the project. At this point in the project schedule we are solidifying the spatial relationships and organization of the building internally and on the site. As the project proceeds details and materials will become better defined. Structural, mechanical, electrical, plumbing, landscape, and civil designs will also proceed with more detail. Thank you to the many who joined us on February 16th, 2017 for the second project open house at the Scheffer Recreation Center. Feedback and questions about the design work to-date have been very helpful. The development of the floor plans and schematic design exterior renderings were reviewed, followed by a question & answer period. Opinions about the future play area and site elements were also received through image voting and conversations with the design team. Use the link below to view the presentation slides from the open house. Additional project updates and important event dates to come. This website will be a good resource for project news and information!